Moonbroth - ZineWiki - the history and culture of zines, independent media and the small press. 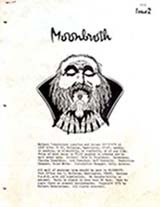 Moonbroth was a horror fiction literary zine edited by Dale Donaldson and published by Malvern Enterprises. Moonbroth was first published in 1971 in Bellevue, Washington, U.S.A. The Secretary for the magazine was Claudia Donaldson, the Production Manager was Oscar White, and the Art Director was Jeff Burchill. The last issue, #30, appeared in 1977, was published by his wife, Jane Donaldson, with Bill Breiding and Sutton Breiding, soon after his tragic death in January 1977. Contributors included Bill Breiding (Star Fire), G. Sutton Breiding (Ebon Lute), William Demic, Janet Fox (Scavenger's Newsletter), B. George Hallenbeck (Nightgaunt), Patty G. Henderson, Phyllis Ann Karr (The Literary Magazine of Fantasy and Terror), Pauline McTavish, Othello F. Peters, Jessica Amanda Salmonson (Fantasy Macabre), Lewis Sanders, and Susan Tannahill. Artwork was by Jeff Burchill and J. Davis. An interview with Dale Donaldson was featured in second issue of the horror fanzine Spoor. The Dale Donaldson Memorial Award was created in his honor. This page was last modified on 4 August 2012, at 20:05.